I’m a big advocate of the importance of preparing for negotiations. Hollywood paints a picture of expert negotiators being the fast talkers with slick tricks willing to do anything to strike a deal. The reality of negotiations is much different. Preparing to close a deal is important, but what’s more important is preparing to walk away. Walking away from a negotiation is like hitting a reset button. You don’t need that vendor, those supplies, that building. There’s always another option, and keeping that in mind gives you a level of confidence that will improve the quality of your deals. Knowing when to walk away, however, can be difficult. You don’t want to ruin the business relationship, but you also don’t want to end up stuck fulfilling a contract that’s not ideal. That’s why I’ve prepared this guide to walking away from a negotiation. Knowledge is power, and the more power you’re armed with, the better you’ll fare in the negotiation. Before entering any negotiation, do your research to understand the possible outcomes. When negotiating the price of a car, for example, it’s important to not only know the price you can afford, but also the value of different vehicles and options. Used cars especially include features you may not be interested in and are unlikely to use, but they do affect the value of the car. Car dealerships also take advantage of people who only focus on one number, like a monthly payment. By lengthening the term of the loan, the lower price on the car is offset by the compounding interest. You end up paying more than you think. If a negotiation is starting to shift too far out of your favor, walking away is a crucial step. But how do you know when it’s time to walk away? This requires you to understand your zone of agreement. Each party in a negotiation has a desired outcome and a worst-case scenario. In a sales negotiation, the seller’s asking price is their desired outcome, but she should also know the lowest price she’ll accept to still do the deal in the worst case. The buyer should also enter the negotiations with a desired low price point while understanding the highest price she’s willing to pay in the worst case. The zone of possible agreement exists between each party’s worst-case scenario, not their desired price. If you don’t know your worst case, you’ll risk giving up too much. At this point, you need to walk away because you aren’t prepared. When you’re prepared to walk away, you’ll have an established Best Alternative to a Negotiated Agreement (or BATNA) you can offer before walking away. This is essentially your final offer. Here’s how it works. BATNA is a term in negotiation theory coined by Harvard’s Roger Fisher and William Ury in a series of books on principled negotiation. Successful negotiators always know their BATNA before entering a negotiation. It’s your last-ditch effort to save the negotiation before needed to walk away. When purchasing a car, your BATNA is to simply go to another dealership if negotiations go south. It’s important not to reveal your BATNA too early in the negotiations, though. Doing so diminishes the power of having this alternative. There’s a chance it may not be as powerful a negotiating tool as you think, and you could wind up losing your last bargaining chip. Figuring out your BATNA can be done in three simple steps, which should be performed before entering into any negotiation. 1. Determine Your Acceptable Range – Although you want the lowest possible price as a seller (or highest price as a buyer), focusing only on that one point leaves you at a weakness, as you’ll be unable to tell how far you’ve veered from it. Instead, calculate the range of values you’ll accept. Rather than looking for a $15k car, shop around for cars in the $10k-$15k range. Knowing this range gives you wiggle room to negotiate. 2. Estimate Their Acceptable Range – To properly gauge the strength of your BATNA, you need to know the other party’s acceptable range as well. Although a car may be listed at $15,000, the dealership is able to negotiate. Kelley’s Blue Book is an invaluable resource, as it lets you know the dealer and private seller valuation. 3. Define Your Absolute Deal Breakers – Price, however, isn’t the only important factor when negotiating. It doesn’t matter how cheap a car is if the transmission is faulty. Listing out unacceptable conditions for yourself beforehand stops you from wasting time in negotiations. If a deal breaker is presented, it’s time to walk away. Even if you do need to walk away, do it in a civil and courteous manner. You don’t want to sever all ties with the other party. In fact, walking away may convince the person to call you back with a better deal. When you realize you’re beyond your acceptable range and your BATNA isn’t accepted, simply smile, thank the other party for their time, shake their hand, and walk away. It’s a powerful statement that displays confidence, courage, and integrity. Even if you never do a deal with that person, you’ll have successfully branded yourself as a person of honor. You can walk around with your head held high knowing you stand for something worthwhile, and word of your savviness will spread. You don’t have to walk away from every negotiation, but you do need to know you can. A walk-away point should be determined before you even approach the table, as it provides you with the confidence you’ll need to successfully negotiate. In order to walk away without getting scared, flustered, or frustrated by negotiations, you need to prepare for the negotiation. Determine the worst acceptable case for both you and the other party, along with any possible deal breakers. This highlights your zone of possible agreement. If the other party refuses to enter your range, offer your BATNA. If this doesn’t work, it’s time to amicably part ways. Try walking away from your next negotiation. You may be surprised at how powerful it makes you feel. What are some things that have caused you to walk away from negotiations? 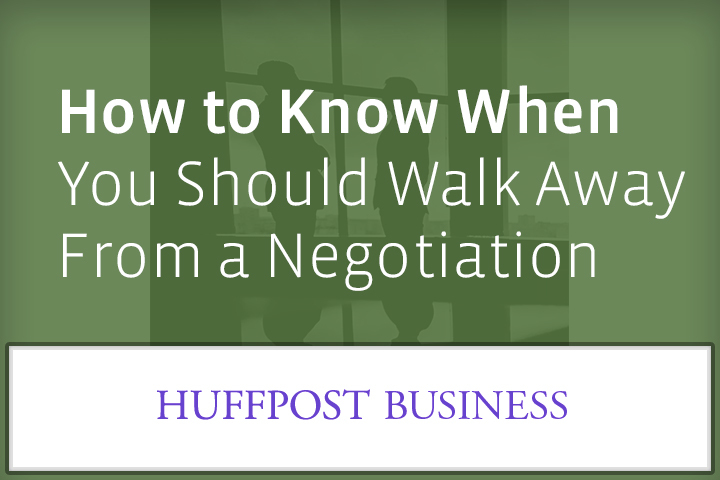 1 Reply to "How to Know When You Should Walk Away from a Negotiation"